Every month the hosts at Food 'n Flix pick a movie and participants then cook up something in its honor. 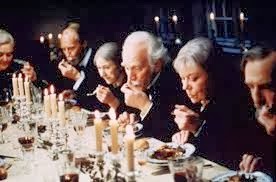 This month the film is truly wonderful: Babette's Feast, an Oscar-winning 1987 Danish movie based on an Isak Dinesen short story. I won't give away any plot spoilers (a great synopsis and film commentary can be found here), but it is a fantastic film on so many levels. The acting is superb, the cinematography makes even the most desolate Nordic shoreline or humble kitchen scene seem fascinating and inviting, and the costumes and sets of the 19th century Danish estates and humble cottages are splendid. Babette, the French live-in servant to two elderly Puritan spinster sisters, has the most fabulous hooded cloak designed by Karl Lagerfeld, which shields her from raging seaside storms and adds a mysterious allure to even the most mundane of her household chores. It is a period drama and yet full of humor. The Danish sisters Martine and Philippa that take in the French Civil War refugee Babette seem to subsist on reconstituted outdoor-dried flounder and a horrendous concoction, Ale Bread, that involves more reconstituting, this time of dried bread hunks, into a unappealing porridge. The household cuisine gradually takes on more flavor and variety when Babette enters the scene, a change which is most eagerly welcomed by the shut-ins that Martine and Philippa bring food to as one of their charitable good works. 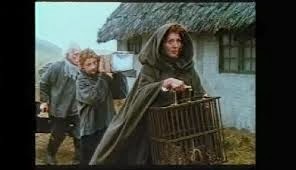 When Babette leaves for a short time at the end of the film, the look on one of the invalid's face when he sees Ale Bread back in his house is priceless. And then there is the metaphor of food and feasting as a way of celebrating life and good friends and even honoring God, as the sisters and their fellow elderly congregants find out at the end of the transformative meal that is the centerpiece of the film. I loved the change in the diners' faces as they go from grumpy to positively ecstatic (certainly the multiple glasses of fine wine helped) by the end of the meal. One of them, a pink-cheeked, bright-eyed woman named Solveig, steals the scene in this regard, taking a sip of water to refresh her palate before knocking back another glass of burgundy, taking care to lick every drop from her lips. For my culinary tip of the hat to this outstanding film, I wanted to make something French. Babette is the wise heroine that has found peace in her new homeland and with gentle Martine and Philippa, and wants to give them the gift of a fine meal to honor their dead father and religious leader. She spends all that she has to give them this present, brushing aside the sisters' protestations when they learn of it, with a simple declaration: "a great artist is never poor." Husband Dan has recently discovered an insanely easy way to make homemade aioli, which we have been slathering on our sandwiches, dolloping on top of salads, and love alongside steamed artichokes. Place all ingredients except salt in your glass. Blend with immersion blender moving slowly up and down the glass until all ingredients have been mixed together and it is a creamy consistency. This takes a minute at most. Season with salt to taste. Makes 1 cup aioli. Store tightly covered and use within a week or so. Not a problem in our house. That's it! A remarkably easy recipe and one which adapts to other mix-in flavors, like Chipotles in Adobo sauce (that's the red in the photo above) , roasted red peppers, curry powder or fresh chopped herbs. Many, many bravos to Babette's Feast! Thanks to Culinary Adventures with Camilla for picking this great film for Food 'n Flix. Stop by later this week to see the roundup of other Babette's Feast posts. Great review Rachel for a beautiful film. (I loved Solveig's pink cheeks too!) ;-) I need to make some aioli--I love how simple the recipe looks and would love to be slathering it over just about anything. Yum! What a fantastic way to make this. 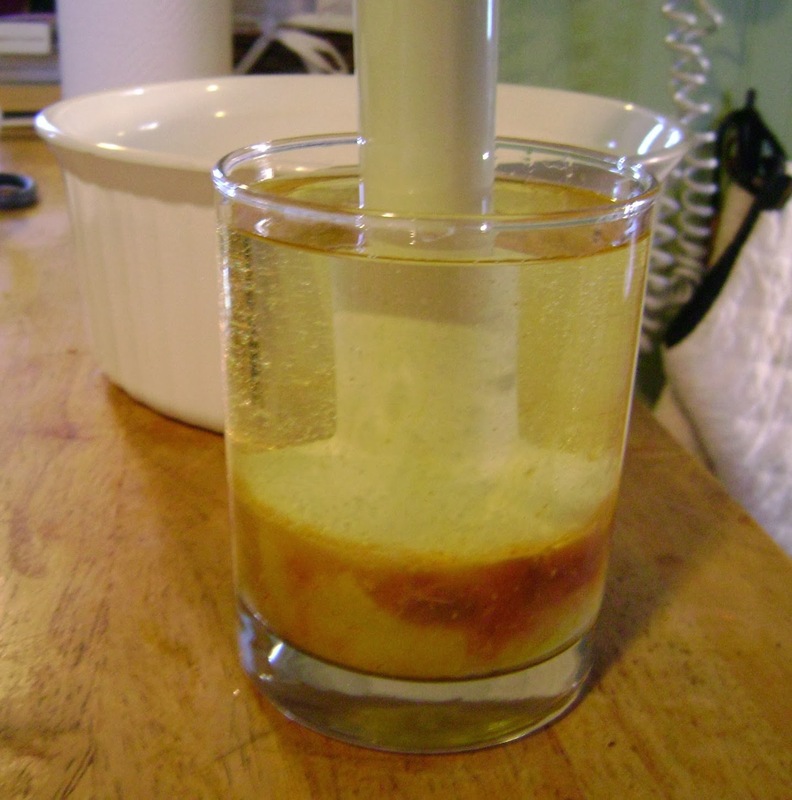 My immersion blender actually comes with a metal tumbler that should work perfect for this method. I love the garlicky flavor of your recipe. 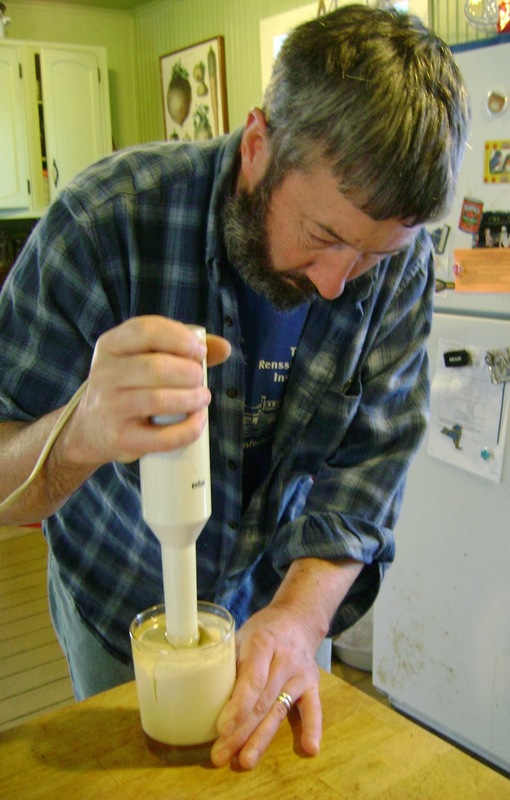 What a smart way to make aioli, I'll have to try it!